We had a depleted team and needed to borrow two players to make up the numbers. There was a bit of experimentation that worked in the first half where the score was 2-2. Unfortunately the continued experimentation failed to work in the second half and we ended up losing 4-2 in a game I think we should have won. This week we had three Players of the Day; Rory Brabant and Charlotte Sancto-Jones for their staunch defence and Isabella Ovenden for her passing and setting up goals on attack. The Asteroids showed they are a team with passion in another very fast and physical game. The opposition had size over us again but the Asteroids didn't let this discourage them. They passed well and had plenty of opportunities under the basket. However, the ball just wouldn't drop in the basket for us. The final score was 8-1 with Ben Rist scoring with 4 seconds left on the clock. Player of the Day went to Jessica Rensen for her diligent defensive play. Great game, team! It was a DRAW, 3-3! The game was so exciting that most of the side-line spectators were exhausted at full time as we certainly felt we were part of a phenomenal match up. Stanmore Bay Spitfires got the game off to a flying start with a long range goal that impressed us all. However our Comets gelled beautifully as a team and their slick passing, quick thinking and excellent defence kept them pushing their opposition for the entire game. In the dying seconds of the match, Rory made an excellent save which stopped the Spitfires from scoring and we had a chance to go ahead on the scoreboard. Unfortunately time was not on our side and we had to settle for a well-earned draw. Teamwork, cohesive attack and backing each other up on defence ensured that the whole team received Players of the Day. Congratulations to each of you – an impressive game at the end of a tough season. Well done! It was a clash of the fierce beasts last week as the darting, deadly Hornets took on the might of the springing, sleek Silverdale Tigers. In a game full of twists and turns, both teams played to their strengths but it was the Tigers who emerged the victors, managing to swat the Hornets with their accuracy and shooting skills. Jared Davies was our Player of the Day for his energy and positive attack throughout the game. It is always good to hear from excited children, parents and managers just how well all our children are playing. More importantly, the sporting attitudes and enthusiasm of our students (even when matches go against us) is outstanding. 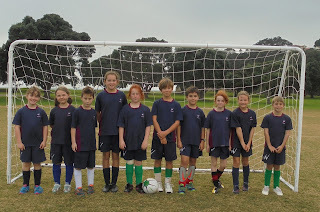 Years 1&2 Wentworth Wonders lost their game against Dairy Flat Captains but held Red Beach Mix to a 1-1 draw. Player of the Day was Ethan Jordan. Years 3&4 Wentworth Wildcats lost both matches against Orewa Utd and RB Falcons but Jared did manage to get onto the score sheet! Player of the Day was Ananda Krageloh. 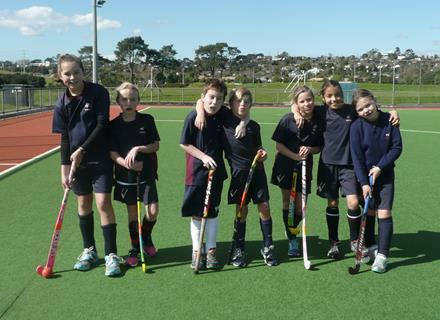 Years 5&6 Wentworth Warriors also lost their games against KW Hawks and SGHB, the latter being particularly close. Player of the Day was Mia Clark. It was great to see the communication increase between the strikers; it was even better to see the passing between the strikers who were looking for space and then scoring the goals. The defenders did a solid job and at one stage we only had two defenders and a goal keeper who were still able to keep the opposition away from the net. Players of the Day were Rory Brabant for his willingness to take shots at goal or look for passing opportunities. The other Player of the Day was Bridie Smith for her communication and goal scoring. Well done to both players. Well done Comets for stepping onto the court and giving it your all on Thursday. This was not easy to do given the late night you all had the evening before at the Kids 4 Kids concert. Each week we improve in some areas and find new skills to develop. Our Player of the Day, Alexander Kawan, most certainly demonstrated an area of improvement we have been working on as a team.......well done Alexander for showing us your dribbling skills this week. Keep it up; it was excellent to see! At training next week we will continue to work on our dribbling and our positioning on attack. See you there! We got outplayed - a combination of poor coaching selection, poor decision making and no communication between the players put us on the back-foot as soon as the game started. At the end of the beginning of the 2nd half we came back from a 2 point deficit to be equal, but then the game moved away from us. The final score was 6-2. Players of the Day were Bridie Smith for her quick passing and assisting with setting up our goals, and also for her defensive work. The other Player of the Day was Maddie Rist for her communication and tireless work as a defender and attacker. Well done to you both. Great defensive skills were shown by the Asteroids. Unfortunately the basket wouldn’t sink for us. However, rebounds in the first half kept us in the game. Player of the Day went to Jessica Rensen for her defensive play and her never give up attitude. Even though the Red Beach Astronauts managed to shoot from all over the court on Thursday, our Comets played a solid game demonstrating their across court improvement. Lots of hustling with hands over the ball ensured that the Comets foiled many a shot. Rosa's speedy retreat down court meant she was always available under the hoop. Alex's excellent long range passes were both strong and accurate. Rosie was dogged in defence, chasing her opposition all over the court. Emily was determined on defence, getting right in the faces of the Astronauts. Rory was solid on both attack and defence, always in the right place at the right time. Corbus received some tricky passes and worked hard to try to dribble his way out of trouble. Our Player of the Day award went to Jared Davies who wove his way up and down the court like a slalom skier. Excellent work Jared. See you at training on Wednesday. The Years 5/6 Hornets had a tough match on their hands last week as they took on SGH Templars. In fact, they played extremely well, not only preventing the Templars from reaching double figures but also managing to score against them! Although it was a loss of 8:1, it was, nevertheless, a good display of teamplay and strategy, forcing the Templars to work hard against our Hornets. Player of the Day was Emily (Shihan) Li. Years 1&2 Wonders lost against WGP Little Rockets 1-3 but won against Red Beach Barons with an amazing score of 4-2! Well done to you all. Player of the Day was Alexie Marston. Miss Sancto would like to forward her apologies for the incorrect score in the newsletter last week for the Years 1&2 Wonders. The score was a whooping 6-0 WIN to the Wonders...well done !! Years 3&4 Wildcats suffered two defeats last week against Stella Hotspur (1-2) and Whanga Jedis (1-4) despite some excellent play. Player of the Day was Jared Davies. Years 5&6 Warriors lost against Orewa FC (3-0) but won against Orewa Girls (3-0). Bridie Smith was named Player of the Day for an outstanding afternoon as Goalkeeper, including some excellent saves againt Orewa FC. It was not pretty but we managed a 7-2 win on Sunday night. Our defence was superb and held out the opposition strikers. Our strikers had lots of opportunities to take control and put the game beyond doubt but unfortunately they did not convert these opportunities into goals. Players of the Day were Raphael Day for his staunch defence and Maddie Rist for her positional play as both striker and defender. It was always going to be a tough match for our young Asteroids who were up against the very polished Red Beach Rockets, however the Asteroids held their own and continued to show their developing understanding of this complex game. The whole team defensive play was impressive, as the Asteroids foiled many of the Rockets attempts at goal. Our Asteroids are growing in confidence and skill, and each week they show their opposition that they are not to be taken lightly. Excellent speed, dribbling and positional awareness earned Xavier Melhop the Player of the Day award. Congratulations Xavier! Keep it up Asteroids – you are certainly an exciting team to watch! It was a game of two halves on Thursday for the Comets, when they faced Stella Lakers. The first half saw the Comets fire up with impressive defence and an excellent team goal. However as the second half clock started counting down, the Comets found they lacked energy after a very full school week and a late Halloween Monday evening. Despite this, the Comets fought ‘til the end, demonstrating their excellent passing game as well as their unrelenting defence. Player of the Day went to Corbus Luke who showed us all his developing defensive dominance as well as some great down court dribbling. Well done Corbus! At training on Wednesday we will all continue to work on our dribbling. See you there! The Hornets began their game against Red Beach Galaxy with only three players although they were soon joined on court by a fourth member of the team. So, it was a brave battle and a display of superb skill from the Hornets which forced Galaxy to fight hard for a victory. The final result was an impressive 4-6, with Joshua only narrowly missing a couple of shots which would have seen our team emerge victorious. Nevertheless, it was an outstanding match from the Hornets and a worthy Player of the Day in Bridie Smith. Having a win is always a good way to start at the beginning of the term. The team played and communicated well, with our defenders marking their opposition and limiting shooting opportunities. Our shooters took advantage of every chance they had and it was great to see Mia Clark score her first points for the season. The final score was 9-3. Players of the Day were Rory Brabant for excellent positioning and defensive work, and Maddie Clark for her tireless work in defence and strike. In spite of a number of players being absent the team played well but seemed to lack fluidity and cohesion. In the end we were beaten by 6 - 5. Although we had plenty of opportunities to shoot at goal we seemed to lack the ability to convert these attempts into points. Player of the Day were Mikayla Cousins for her staunch defensive work and the other Player of the Day was William Turton for his willingness to play at both ends of the pool and outstanding gaol keeping in the second half. We won! This game had us all on the edge of our seats and I am sure that many a spectator lost their voice after all of the sideline cheering. SGH Titans were a formidable opposition with the score on the board swinging like a pendulum between both teams. Our Asteroids were certainly dogged, scrappy and determined on defence, which gave us the winning edge. Teamwork was the difference this week, with every member of the Asteroids backing up each other! Passing was accurate. Defence was solid, and everyone gave it their all. There was no single Player of the Day this week as the entire team deserved the trophy. Congratulations to each of you for your effort and commitment throughout this game. It is certainly going to be an exciting season! The Asteroids showed today that they are a team to be looking out for. Taking on the strong team of Whanga Thunder, they surprised them with their determination and defence. The final score was a loss but with the defence, produced by the Asteroids, kept the score down with many missed shots and lost rebounds for Whanga. The Asteroids are improving week after week and are on the way to great wins in the future. Congratulations to Ben Rist for Player of the Day for his hustle, rebounds and controlled shooting. Welcome to Kahn Heath. Great work team to you all! We won and my oh my, what a game! It was without a doubt a full team effort. All seven members of the Comets contributed to this exciting win. Rory's passes were like watching a hot knife slice through butter - smooth and accurate. Alex left it all out on the court as he raced up and down interrupting the attacking flow of the Stanmore Bay Spitfires. His shooting was phenomenal too! Emily found an inner warrior and was extremely disruptive on defence. Jared's eye was in, as he made some exciting long shots look easy. Rosie attacked the ball in defence with a determined spirit not seen before. Rosa's on court positioning was excellent as she was always ready to receive some tricky passes from her team. Corbus stole the ball from the opposition demonstrating his commitment on defence. I am sure that you can all understand why it was impossible for one player to be singled out this week so the Player of the Day trophy went to the entire COMETS team! Well done to each of you; see you all at training next Wednesday at lunch time! Thursday 27 October - With tired legs the Comets stepped onto the court to face the SGH Titans. MOTAT certainly drained our energy yet we were determined to give it our best shot. At half time things looked a little dire. The Comets were feeling a bit lack lustre and because of this the Titans were running us ragged all over the court. Yet, after a quick half time recharge we stepped back onto the court with fire in our bellies and a defensive display that was exciting to watch. Whilst the scoreboard betrayed us, we certainly demonstrated some exquisite passing and fiery defence. Our Player of the Day went to Emily McLeish for an exceptional effort on defence. Congratulations Emily. On Wednesday, our team will work on dribbling to ensure that we are not just playing a catch and pass style of game. See you Wednesday! It’s been a hard-fought couple of weeks for the Hornets as they have faced some tough opposition in their Term 4 grading games. In their first match against Red Beach Supanova, the Hornets battled bravely and displayed strong team spirit but, despite some excellent play, they were unable to get the ball through the hoop to score. The match finished 6:0, with William Turton named as Player of the Day for his constant effort throughout the game. Putting that behind them, the Hornets faced Stanmore Bay Centurions in their second grading game. Refreshed and ready for anything, they took complete control of the game from the outset. With absolute determination, they put on an outstanding display and finished the game with a score of 10:0. The Player of the Day was Joshua Hill for his awesome play. This game was the final for the term and we were playing for First place. It had the hallmarks of being a great game, particularly when you consider that the last time we met this team we lost 6-0. It turned out to be a fantastic game where the lead changed throughout the game and, at one point, we were two points ahead at the end of the first half. Unfortunately we couldn’t hold the lead and lost 3v5. The team played a fantastic game but were unable to convert our opportunities into points and our defence started to tire. Players of the Day were Maddie Rist for her dynamic defence and attack. The other Player of the Day goes to the rest of the team. Great job, you should be very proud. A draw! Congratulations Asteroids - you fought hard in this game and it was great to see you come away with a draw (2-2) after such a tough and exciting match. Every member of this team worked as a unit, demonstrating some slick passing and rugged defence. I have never seen a game need so many 'jump ball' restarts, and that is purely due to the 'never give up' attitude displayed by all of the Asteroids. At one point I thought I was watching a wrestling match as there were players all over the floor of the court fighting to maintain possession of the ball - Well done! Player of the Day went to Xavier Melhop for making two important steals at key moments in the game and for working hard to disrupt the flow of the game for the other team. Congratulations Xavier - you continue to improve each week! Red Beach Rockets are an excellent miniball team and in the past they have beaten us by some very large margins - NOT this week however. Although we did not go home with the win we certainly were not easy opposition. Our defensive game was excellent. The Rockets had many attempts at goal that were thwarted by the well positioned hands of a Comets player. Whilst there were some excellent passes between our players this week, we are still using too many long loping lob throws which are easily intercepted by our opponents. This is an area of our game that we can continue to work on. Player of the Day this week went to Rosa Clark. Rosa has come to miniball from a netball background where she is used to catching and then immediately passing the ball. This week Rosa was working hard to catch the ball and dribble before passing, and it was great to see Rosa introduce this skill in her game. Rosa was also available to receive some tricky passes. Excellent work Rosa! The Hornets faced the SGH Templars last week. They were prepared for battle and put their best strategy into action to take control of the match from the outset. At half-time, the Hornets were in the lead with the score 5-0 but the Templars rallied and came back strongly in the second half of the game. However, the Hornets are not a team to relinquish control easily and they moved their game up a notch to finish the match victorious, with the score 7-3. Player of the Day was Austin McAlpine for his speed of attack and his accurate shooting. Well done, Hornets! For reasons such as sickness, injury and other duties our team was lacking four important players, which required getting a player from another team to join us. The team played well and in-spite of the absent players, they were able to organise themselves and play a solid game. We ended up winning 7-3 which hopefully puts us in the finals, playing for 1st place next Sunday. I am hopeful that we will have a full complement of players as everyone will be needed. Players of the Day were Charlotte Sancto-Jones for her great defensive work and then filling in as goal keeper in the 2nd half and Liam Phillipps for his tenacious defensive playing. Well done to both Players of the Day. This was the toughest game of the term and one that ended up a loss for Wentworth 0-6. Even though we lost by 6 points our defence was very good. The team played to the game plan and showed solid defence and very good goal keeping. Our strikers had opportunities but failed to convert their shots at goal into points. Players of the Day were William Turton for his goal defence. Rory Brabant for his solid defensive play. Well done. The side-line was buzzing at full time with talk of pride and admiration for this hardworking Asteroids team. Stanmore Bay Samurai's were tough opponents and the Asteroids really held their own throughout the game. Gritty and persistent defensive play by the Asteroids team certainly hampered the Samurai's flow. Overall this new team are certainly coming to grips with the nuances of basketball and they are developing an excellent understanding of positional and strategic court play. Player of the Day went to Benjamin Rist for his dogged and determined defensive effort throughout the entire game. Congratulations Ben. There will be no game on Thursday 8th September as the Leisure Centre is having new hoops installed. Mrs Houseman will see you all at training on Monday after school. Monday training will be cancelled if it is raining. Kingsway Inferno came to play and we certainly matched their efforts. Connections across court were crisp, with the Comets displaying more secure passing this week. Defensively we played tough, but fair, and I was proud to see such a committed effort from our Comets. Unfortunately the ball would not fall into the hoop for us this week despite the many goal attempts we had and therefore the scoreboard swung in favour of Kingsway at full time. Our Player of the Day went to Corbus Luke for working hard to make himself available on attack and for some quick and accurate passing during the game. An excellent effort Corbus - well done! There will be no game on Thursday 8th September as the Leisure Centre is having some new hoops installed. Enjoy the rest this week and we will see you at training on Sunday. It was another tough game for the Hornets last week, as they faced SGH Crusaders. Although the teams were evenly matched, the Crusaders just managed to get the ball through the hoop to win the match 6-3. Player of the Day was William Turton for his energy throughout the match. The hardworking Hornets continue to display a strong team spirit and enthusiasm for the game, which sees them get stronger as time goes by. There was yet another amazing netball game from the Wentworth Warriors on Thursday evening. After getting off to a rough start, the girls quickly got into the mode and took control of the game. Our attack and defence did not allow the ball to enter into the opposition’s goal in the first quarter. Rosie was outstanding playing in the position of centre. Wherever the ball was, Rosie was right there. Charlotte got two incredible goals playing in Goal Shoot. She read the play well and found great space, as well as getting some great intercepts. Every team member played extremely well and contributing to the final score of 12-3 to Wentworth. It was very difficult to choose a player of the day therefore it went to both Rosie and Charlotte. 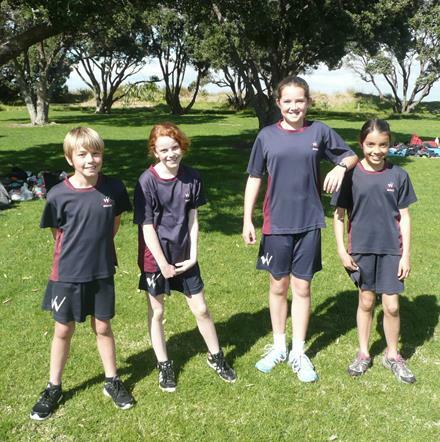 The first day of Spring was heralded by the sound of many feet in Shakespear Park as the Interschools’ Cross-Country Run took place. We fielded four students from the Primary: Maddie Rist; Austin McAlpine; Annie Duncan and Emily Treble. We were able to support our College Years 7/8 team, who performed extremely well in their respective races and were able to pass on some tips for the tough terrain ahead. Despite some nerves, our runners did a fantastic job, pacing themselves sensibly to leave enough energy for a sprint finish, with Austin and Emily winning their particular battles for the finish line. Placings: Maddie (29th); Emily (21st); Annie (retired due to injury) and Austin (9th). Each race had well over 50 runners and the competition was extremely tough. This was a game that allowed the team to swap some of the positions where defenders had a go at strike and strikers had a go at defence. It was great to see the players get an understanding of how difficult each of the roles are. Wentworth won 6v1 and Players of the Day were William Turton for his fast passing from goal and good goal defence. The other Player of the Day was Mikayla Cousinsfor her defensive work and staying on her feet to stop shots at goal. Well done to both players. On Thursday evening it was clear to see how much the Asteroids have improved! As the Asteroids stepped onto the court you could tell they had something to prove. The last time the Asteroids met Stella Nicks, the Asteroids were 10 down at the end of game time. Fast paced attack and some excellent defence saw the Asteroids set the standard early in the match. Stella Nicks had to fight hard the entire game and even though they won, it was only by 3 points. Excellent work Asteroids! The Asteroids are certainly making themselves known as the team to watch in this league! Player of the Day went to Amy Akehurst for her ability to play with commitment and determination despite the fact that she had been injured early in the game. Excellent work Amy. Training times have changed for this exciting team. Mrs Houseman will train the Asteroids on Monday after school on the astroturf. Training will end at 4.30pm on Monday. If it is raining then the Monday training will be cancelled and the Asteroids are to meet in the gym on Sunday morning. What a way to come back, Comets! Thursday's match against Kingsway Wildfire was phenomenal! Kingsway led the scoreboard for most of the game, however the Comets' tenacity shone through. The Comets NEVER gave up and played until the final whistle. With 23 seconds to go, the score was level at 7 all. Kingsway were in possession of the ball and as they made their way past half way the Comets intercepted. Rory grabbed the loose ball and sped towards our basket. Kingsway were trying to catch him but couldn't. As Rory reached the key we all heard the "Beep, Beep, Beep", of the full time buzzer. We will never know what might have been with two more seconds on the clock but either way those on the sideline were screaming and the Comets walked off the court with beaming smiles on their sweaty faces. Exciting stuff! Player of the day went to the entire Comets team for backing up after a tough game last week and giving it their ALL! Well done Comets. You should all be proud of yourselves! NOTE: NO TRAINING THIS SUNDAY DUE TO IT BEING FATHERS DAY! You just can’t keep a good team down! After their defeat last week, it would have been understandable for our Hornets to take some time to recover. However, that is not the Wentworth way and our Years 5/6 players came out fighting against Red Beach Galaxy. With William injured and Annie otherwise engaged, our team fielded only four players yet still managed to put on a dazzling display of basketball to win their match 10:0. Player of the Day was Shihan Li for her excellent interceptions. Outstanding work, Hornets! The Wentworth Warriors just keep getting better every week. Although we lost 16-10 to Sports Gulf Harbour, it was one of the best games I have seen the team play. The girls are developing great understanding of both a defensive and attacking game, finding space and defending their partners. Rosie is proving to be a player to watch as she is very quick to read the game and get into space, as well as having great defence tactics. Bridie is another player who is dynamic and able to play many positions well. Maddie is relentless and highly competitive on the court with great shooting ability. However player of the day went to Emily Li for an amazing defensive game in Goal Defence. She closed her partner down on many occasions. Without Emily I’m sure the score against us would have been greater. Well done to all the girls for their perseverance as it was not an easy game in the pouring rain and cold. Our first flippaball game for the term started off slowly as players got used to their positions. As the game progressed it was pleasing to see the players get settled into their role and focus on their passing and striking. There was a high level of communication between the players as they began to play as a team. The final result was 8:4 to Wentworth. Player of the Day was Isabella Ovenden for her communication and selfless play in passing the ball to players who had better shooting opportunities. BASKETBALL - HORNETS - End of Term 2 - 2016 CHAMPIONS!! After months of training, dedication and hard work, our wonderful Year 5/6 basketball team, the Hornets, have won their Term 2 league competition. It was a fiercely-contested final game against Red Beach, with our team down to 5 players and no substitutes due to holiday dates. There was really very little to separate the teams, with all players determined to take top spot. It was gripping, non-stop, end-to-end action as passes and interceptions saw the game change direction in the blink of an eye. With the Hornets behind in the last couple of minutes, the supporters could only hold their breath as William was awarded a penalty shot, which he took full advantage of, putting the ball expertly through the net to draw level. It was in the dying seconds of the game, with the referee putting the whistle to his lips that Austin managed to pass the ball to Maddie who fired it through the hoop to bring a well-deserved victory to the Hornets. An oustanding Final from both teams and an excellent result for our players (11:10). Congratulations to the Hornets and to coach, Stephen Hill. The first Flippaball game in Term 3 will be played this Sunday on 31 July. In our last game, the team played well! We were missing some of our players, which meant some had to play in new positions. It was pleasing to see everyone got involved and played to their best. Player of the Day was Charlotte Sancto-Jones for a fabulous game despite taking a ball in the face! Unfortunately we lost 6:3 but it was an evenly matched game and really could have gone either way. The team is definitely starting to come together. The awareness of positional play, passing and looking for gaps is becoming more apparent which is resulting in a more fluid style of play. The strikers are starting to be fed clean ball by the defenders which is opening up scoring opportunities. Player of the Day was William Turton for passing the ball between himself and the other strikers and taking good shots at goal. With sharp passing and quick communication the Asteroids pulled another win! It was a close and competitive game winning 2-1. Oliver Le Cheminant was named Player of Day for his ability to find the open space on the court. Well done Ollie! We had a rushed start to our game this week which put the Comets on the back foot, however they pulled together in the second half and worked together brilliantly. It is exciting to see how they are getting the hang of defending and blocking their opponents and becoming confident in holding onto the ball and dribbling it instead of passing it straight away. Although we were pipped at the post by the Whanga Fasties, 5-4, it was a close match and the Comets kept on trying their best until the final whistle blew. Good on you, Comets! Player of the Day was awarded to Rosa as she never gave up, made an effort to dribble the ball more and put in a huge effort to move around the court and to help out her team mates. The Hornets took on Stanmore Bay 7 last week in an exciting game, which saw some excellent positional play by our team. Although the first half was evenly matched, the Hornets returned supercharged to the court for the second half and took the playing up several levels. With excellent passing and determined attack, they dominated the remainder of the game, finishing 19-6. Shihan Li was named Player of the Day for her on-court energy and outstanding play. Well done, Hornets! An absolutely smashing game was played by the netball girls on Thursday evening. After the first quarter it was a draw, 2-2. Our girls went into the second quarter firing to take the lead and from there on they dominated the game. Maddie was on good form, putting up goal after goal apart from one time when the ball just would not go into the hoop. Orewa couldn’t break through our defence of Mia, Emily and Kiera. All the girls are beginning to play as a team and use the court to their advantage. The final score was 14-3 to Wentworth. Well done girls on a great game and result. Player of the day was Emily in Goal Keep with some spectacular intercepts. Football fever gripped Wentworth Primary last week as our Years 5/6 squad, the Wentworth Tigers, set off to play in the Rodney Interschools Soccer Tournament. Our team was a new entity containing a mix of experienced players and novices, who had only a couple of training sessions together before the big day. Nevertheless, they were determined to do their best and enthusiastically took to the pitch for the group matches. As there was no mixed league this year, our team was in the Boys ‘B’ League, playing Warkworth 1 (loss), Stanmore Bay (loss) and Silverdale (win). They also played against Kingsway Thunder, a team from the Boys ‘A’ League and beat them (2-1) in a tough match. Although the Tigers did not qualify for the semi-finals, the team grew stronger and stronger with each game and it was exciting to see each player develop their skills and strategies over the course of the day. Congratulations to all our wonderful players and a huge thank you to the College students who coached our team during lunchtimes. Wentworth Tigers: Mia Clark, Mikayla Cousins, Raphael Day, Annie Duncan, Austin McAlpine, Liam Phillipps, Maddie Rist, Charlotte Sancto-Jones, Bridie Smith and William Turton. There was a huge improvement from the whole team, the goal keeping, passing and communication between defenders and strikers were excellent. The defenders defended the goal stoutly which allowed our keeper to clear the ball to the midfield who passed it to the strikers. Player of the Day was Bridie Smith for her excellent positioning and strategic playmaking. Well done. The Asteroids certainly took it to Kingsway Edge on Thursday evening. Feisty defence and smart attacking options saw the score remain close between the two teams. Fitness and fatigue took their toll on our young Asteroids with Kingsway ironically ‘edging’ us out of the winner's circle during the final half. The Asteroids are certainly displaying some excellent team tactics and it is lovely to watch the attacking connections grow in this newly formed team. Player of the Day went to Jessica Rensen who demonstrated dogged and determined defence for the entire match. Well done Jessica – you continue to improve in all areas of the game each week! See you all on Sunday at training. The Comets held their own in their closely matched game against Kingsway Wildfire. Both teams were competitive and the score swung like a pendulum throughout the first half. Kingsway managed to take the game in the dying minutes of the second half, yet it was no easy feat as the Comets put in a gallant effort until the final hooter sounded! Close matches are often a test of our physical fitness and fatigue started to get to us at the end of the game. This is certainly something we can continue to work on at our Sunday morning training sessions. Player of the Day this week went to Jared Davies who, despite having been unwell during the week, was our superstar shooter! Well done Jared. The Hornets had tough opponents in the form of Red Beach Supanova last week. It was a fast-paced, exciting game with both teams fighting to keep control of the ball and, with one player running late, the Hornets were fielding a short team for most of the first half. 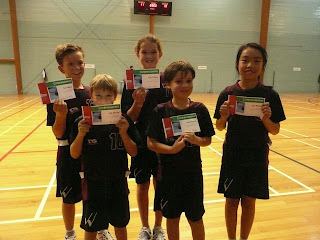 The Supanova team finally out-ran our players, with the score finishing 8:2 but the Hornets played tremendously well. Austin McAlpine was named Player of the Day for his determined chasing of the ball and excellent defensive work. Thank you to Michelle Jordan for stepping in as manager for this game. This week was really fantastic. We played Stanmore Bay and won 13-0. It was great to see how the Wentworth Warriors pulled together; we are starting to work really well as a team. Our passing has improved and the team are learning to read each other’s game which is helping. Maddie and Annabelle worked brilliantly together at goal, and Teresa popped up all over the place wherever she was needed. Player of the day went to Mia for her wonderful intercepting and great general play. This week saw some very strong defensive work and communication between all the defenders. The strikers positioned themselves so that they could maximise their goal score opportunities and it was great to see some spectacular goals being scored. It was also nice to see some accurate ball passing from defence to mid, and then onto the strikers. Player of the Day was Isabella Ovenden for excellent positional play and striking capabilities. The Hornets had a storming match last week against Stanmore Bay 8, winning 16-0. Passing and positioning were the order of the day, with the Hornets buzzing all over the court to find space. Annie Duncan was the Player of the Day for outstanding defensive work. Well done, Team! It was a tough outing for our Comets this week. Whanga Thunder are a formidable opponent and they certainly showed us some flamboyant basketball moves. Each member of our team walked off the court at full time with rosy red faces that were covered in sweat! Player of the Day this week went to the entire Comets team for demonstrating a committed attitude and for never giving up. We are a better team when we play tough opposition and each of you deserve to be congratulated for giving it your all and leaving everything on the court. Well done Comets. See you at training on Sunday. The Asteroids showed up to play this week! The scoreboard did not reflect the effort, skill and commitment demonstrated on court. Passing was accurate, defence was fierce, and all above else, the Asteroids had fun. This team is becoming an EXCITEMENT MACHINE and they are certainly on my ‘MUST WATCH’ list for the week. Player of the Day was awarded to Benjamin Rist for demonstrating the skills he has developed in training and showing us some excellent low passing bounce balls. Well done Asteroids. See you at training. We had an extremely tough game last week in the persistent rain plus being three players down. However we soldered on by borrowing a player from the opposition team. Everyone played their hearts out but the odds were stacked against us. The defence had work consistently hard to stop the oppostion scoring. When we managed to get the ball down to our end of the court, Maddie put the ball through the hoop and scored a goal. We lost 11-3 to Silverdale. Teresa Sell was player of the day for great defence as WD. Despite the fact that Mrs Houseman could not make it to the game due to illness, the Asteroids soldiered onto the court ready to face Stanmore Bay 4. Confidence was the main word that spread up and down the sideline. The Asteroids were brave, determined and did I say CONFIDENT…..facing their opponents. This new group are developing excellent teamwork and many players are beginning to demonstrate the skills to free themselves from their opposition, to get ready to receive the ball. Communication has improved already and it was great to hear players calling for the ball – well done Jessica. Our much deserved ‘Player of the Day’ went to Amy Akehurst for her tenacious defence and exciting attacking play. You really committed to the ball, Amy – Keep it up! See you all at training on Sunday. The Red Beach Rockets were a formidable opponent last week and our Comets worked hard to meet the challenge. Unfortunately the scoreboard did not reflect the commitment, effort and teamwork demonstrated on the court by the Comets. Our team are becoming strategic game players and are developing excellent connections with each other. We look forward to working on our key defence to ensure we can combat any attacking team who is trying to score in our hoop. ‘Player of the Day’ went to Jared Davies for his excellent defence. Jared, your speed and commitment on defence was fabulous. Keep up the amazing jumping when screening the ball – it is impressive! Well done. See you all on Sunday. The Hornets faced Sport Gulf Harbour Ally Oops last week and put their newly-developed game strategies to the test. With improved passing, communication and positional play, the Hornets hit their stride and took control of the match. The final score was 14-0 with Annie Duncan named as "Player of the Day" for all-round improvement and shooting accuracy. Well done, Hornets! Each game results in an improvement with our play. This week the focus was on throwing accuracy and defensive play. It was so pleasing to see the ball being passed between the players which resulted in some shots at the opposition goal. The defensive marking and awareness continues to get better which helped save a number of goals. Player of the Day was Rory Brabant for his excellent defensive play. No Netball was played last week as all Year 6s were away in Wellington. The Asteroids are in a consolidation, learning phase and it is wonderful to see you all implementing the skills you have been rehearsing in training. Mrs Houseman is doing an excellent job as your coach. It is important to remember that each team we face allows us to develop new game strategies and to learn more about ourselves as a whole team. This week against SGH Titans we worked on our dribbling, court positioning and our overall understanding of the game. Each week, Asteroids, you improve and it is so exciting to watch your skills develop. Well done to each of you! Our ‘Player of the Day’ went to one of the fastest members of our team, Xavier Melhop. Xavier is only new to miniball yet he is proving to not only be fast on the court but also a fast. There will be no training this Sunday, so rest up and relax, ready for next week’s game.